Carpenter ants are considered to be one of the largest-sized ants within the United States. These insects may measure up to 13mm in length. 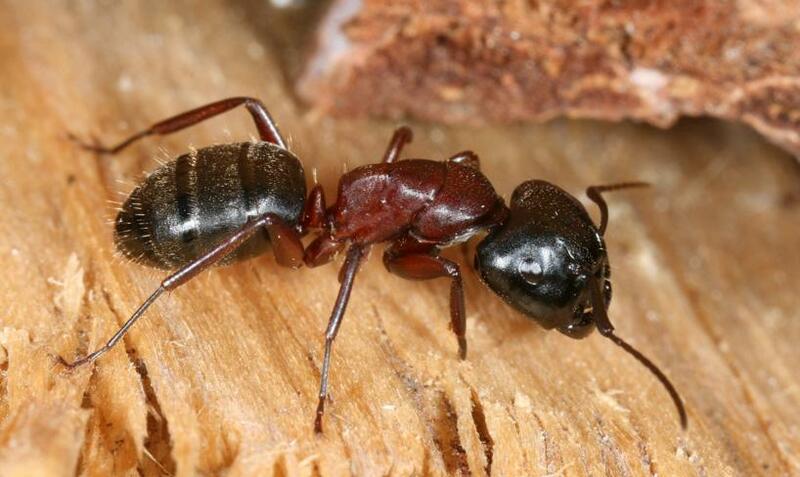 Most carpenter ants are black in color; however, there are those that are dark brown, reddish, or even yellowish. These ants are capable of living both inside of and outside of structures. They nest in wood that is considered to be hollow, moist, or even decaying. They are capable of cutting specialized galleries within the grain of the wood. This is how the carpenter ant forms its nest. They also use this procedure to create passageways within the wood so that they may move from one area to another with ease. It is important to understand that carpenter ants do not actually eat wood; they simply moisten the wood and use it for nesting purposes. Carpenter ants actually consume the same types of foods that people eat – specifically, meats and sweets. There are many signs that may indicate that an infestation of carpenter ants is present. In most instances, you will either see a worker ant moving along, or, you will observe a swarmer ant (one that has wings and flies) that is large in nature. In other instances, you may notice wood and organic debris that looks like wood shavings in the area where the ants have been tunneling. If there is a carpenter ant infestation in your home or another structure, you may hear rustle-like sounds. This is the sound of the carpenter ant engaging in activities such as nesting and tunneling through the wood in which they have invaded. Carpenter ants for their name because of the fact that they prefer to have their colonies within damp, hollow, or damaged wood pieces. Instead of consuming wood, the ants moisten the wood and move it outside of their nests within piles that are quite small. These types of ants have very clean nests. In fact, the galleries of the wood where carpenter ants live is often very smooth because of the hard work and dedication put in from the worker ants within the colony. The carpenter ant may elect to reside in wood that is dead or alive – it all depends on the amount of moisture that is present within the targeted wood. The carpenter ant prefers very moist wood. Carpenter ants typically have two distinct types of nests. One type is called “parent colonies” and the second type is called “satellite colonies”. The parent-based colonies include a queen, workers, and a brood. The satellite-based colonies include the worker carpenter ants, the larvae, and the pupae. One parent colony may include many different satellite colonies. As the population of ants grow in a parent colony, the additional satellite colonies are created. In order to successfully eliminate carpenter ants, you must first find the nest of the insects. You may then eliminate the nest or use an insecticide to treat it. Carpenter ants have the capability of causing structural damage to homes and other types of buildings.